Plankton has a new invention that allows him to switch lives with Mr. Krabs. // When Larry the Lobster is short one man for lifeguard duty, SpongeBob Volunteers. Spongebob and Patrick build a small clubhouse in a tree - when Squidward wants to join their club, he literally doesn't "fit" in. // SpongeBob finds a stray sea horse and adopts it. SpongeBob becomes obsessed with the fact that Squidward has never actually tried a Krabby Patty. // The new bully in school, Flats, threatens to beat SpongeBob up after school. Mr. Krabs has to whip the Krusty Krab into shape in order to pass health inspection. 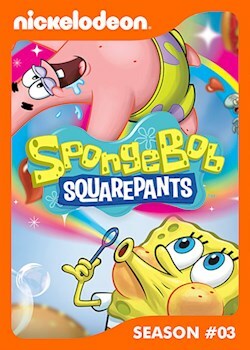 // When Spongebob and Patrick get a large screen TV, they throw out the TV and keep the box. Spongebob gets a hold of Mermaid Man's utility belt and accidentally shrinks all of Bikini Bottom. // Ms. Puff takes the blame for an accident Spongebob caused and goes to prison. It's snowing! Spongebob and Patrick try to show Squidward how much fun it can be to play in the snow. // Mr. Krabs has a garage sale and sells Spongebob the most valuable of items. Spongebob makes a one second cameo in a Krusty Krabs commercial. // Fed up with Mr. Krabs insults, Squidward quits his job - but has a hard time finding a new job. Spongebob has to prove that he's tough so he can get into the Salty Spitoon. // Squidward's arch nemesis, Squilliam, returns to harass Squidward on his failed life since high school. Spongebob and Patrick must paint Mr. Krabs living room without getting a drop of paint on anything but the walls. // Learn how to become a Krusty Krab employee in this episode. Spongebob decides to throw a big party after discovering a "how to throw a party" kit in the grocery store. To make some extra cash, Spongebob and Patrick decide to sell chocolate door to door. // Barnacle Boy wants to be called "Barnacle Man" and rebels when everyone rejects his request. Patrick joins Ms. Puff's class but begins to get Spongebob in a lot of trouble causing him to lose gold stars. // Mr. Krabs takes Spongebob and Squidward on a clam fishing trip. Squidward gets a pure-bread snail, Snelle, and decides to race her in the snail races. // Mr. Krabs feels old so he asks if he could join Spongebob and Patrick on a wild night out. Mr. Krabs gets ill after eating an old Krabby Patty that he refused to throw away. // SpongeBob has an accident while sand sledding! Afraid for his safety, he won't leave his house. Mr. Krabs aims to squeeze every penny out of kids on summer break by building a playground in the Krusty Krab. // SpongeBob and Patrick lure Squidward to their backyard campout. Spongebob desperately searches for his missing name tag. // Plankton enlists his relatives to help him steal the Krabby Patty Secret Formula. SpongeBob is jellyfishing when he wistfully realizes that he wants to fly. // Patchy the Pirate is set to present a never before seen episode of Spongebob with one problem - no tape. SpongeBob catches someone littering and turns him in - but it's the Tattletale Strangler! // SpongeBob and Patrick invest in some magic "invisible spray" at the local prank shop.